RANGOON — The world knows Burma for its Noble laureate, Aung San Suu Kyi. “The Lady” is a prominent political figure and leader of the pro-democracy movement who spent years under house arrest. But the people of Burma have a new lady in the spotlight now, the country’s incoming first lady, Su Su Lwin. But who is Su Su Lwin? Before her husband, Htin Kyaw, became Burma’s president-elect, people knew Su Su Lwin as the chairwoman of the Lower House’s International Relations Committee and head of the education committee in Suu Kyi’s National League for Democracy (NLD). She helped drafted the controversial National Education Bill, which in 2015 resulted in nationwide student protests. But her relationship with Suu Kyi and the NLD goes much deeper than that. Even though the 63-year-old former educator wasn’t a party member when the NLD was founded in the late 1980s, she was no stranger to the party. Her late father U Lwin was a former colonel in the Burma Army and a leading figure in the NLD, which he helped found and later served as party treasurer. As U Lwin’s daughter, she witnessed the birth of the NLD. At that time, Su Su Lwin had a post-graduate diploma from Sydney University, a master’s degree in English from the Rangoon Institute of Education and had worked for over 10 years at Burma’s education research bureau. Suu Kyi took notice of Su Su Lwin’s education background and asked her to teach English to NLD youth members at her home, after all schools and universities across the country were closed following the 1988 pro-democracy uprising. According to Zaw Aung, an independent social researcher who was then an NLD youth member and a student of Su Su Lwin’s, there were about 20 students in the NLD English class. They were all student activists who had been involved in the 1988 demonstrations and later joined the NLD. He remembers her as a “great teacher” who was very passionate about education. “Her teaching methods were different from any others I had ever received in my life,” he told The Irrawaddy on Wednesday. For Zaw Aung, Su Su Lwin’s student-centered approach was a new experience. The classroom was fun and interesting because Su Su Lwin was always friendly, lively and patient with the students, he said. She taught them not only language skills, but also used English novels and short stories to teach them critical thinking. But after less than six months, the class had to stop when Suu Kyi was put under house arrest in July 1989. Su Su Lwin told her students to come to her home instead if they still wanted to learn from her. But former student Zaw Aung was also imprisoned and spent 10 years in jail. Su Su Lwin’s commitment to education was noticeable to everyone around her. Suu Kyi’s former personal assistant, Dr. Tin Mar Aung, echoed Zaw Aung’s opinion. “She is always so eager to share what she knows with others,” she said. Su Su Lwin and Dr. Tin Mar Aung worked together at Unicef for about a decade, where they became close friends. She portrayed Su Su Lwin as a caretaker who treated everyone around her like family. They each have an intimate relationship with Suu Kyi and sometimes spent time together at Suu Kyi’s house talking about cooking and books, she said. Before getting involved in politics, Su Su Lwin invested most of her time in the education sector. She worked for Unicef from 1990 to 2005 and later served as a freelance consultant for monastic education programs. She founded a local non-profit organization called Hantha Educators in 2006 that partnered with local influential monks and focused on improving traditional monastic education, early childhood care and development programs. She was concerned about the lack of education opportunities for the poor, especially in Sagaing Division and Arakan State, and the failure of many development programs to reach those most in need. Her organization stressed the importance of child-centered teaching and critical thinking. Her former student, Zaw Aung, crossed paths with her again after his release from prison, when they both worked at Unicef and then at Hantha Educators. Zaw Aung remembers her being a vegetarian and her tendency to bring vegetarian meals to her office for colleagues. “She knows how to cook vegetables deliciously,” he said. Zaw Aung said she was kind and modest, despite growing up in an elite family, with a father who served as a minister during Gen. Ne Win’s socialist regime. She married Htin Kyaw in 1973 when she was 21-years-old. According to a 2007 interview with Htin Kyaw in local art magazine “Padauk Pwint Thint,” Su Su Lwin was even more familiar with Htin Kyaw’s father, the prominent Burmese poet Min Thu Wun, because she had translated some of his poems into English. Despite her close relationship with Suu Kyi, she told The Irrawaddy that she officially became a NLD party member just before the 2012 by-election, when she won a seat along with dozens of fellow party loyalists. She dived into Burmese politics before her husband, and has represented Rangoon’s Thone Kwa constituency in Parliament ever since her 2012 victory, winning re-election to the seat last year. While working for Unicef, she was not supposed to show any political affiliation, so she avoided being in the public eye. 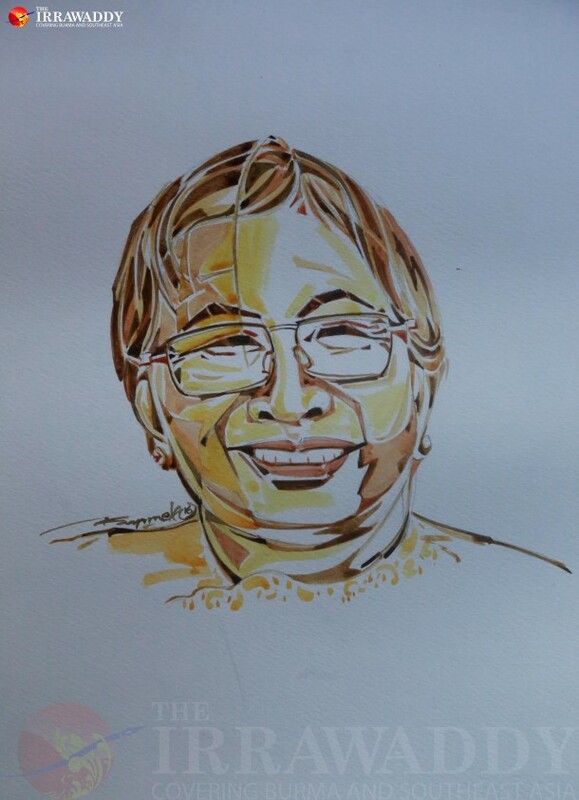 But as the daughter of U Lwin, she witnessed every change and development of the NLD, Zaw Aung said. “It’s remarkable that not only the president-elect, but also the first lady, played historic roles in assisting Daw Aung San Suu Kyi,” he added. He believes that Su Su Lwin can be more than a first lady. Given her proven independent streak, passion for worthy causes and dedication to country, Burma’s next first lady promises to be a trailblazer in her own right, breaking a mold set by recent predecessors at a time of countless firsts in a democratic transition that continues to unfold. Additional reporting by Kyaw Phyo Tha and Sandy Barron.